Three more victors in Lucky18Casino.com’s March Madness Blackjack Tournament advanced to the April 15th Championship after making it to the “final four” in Monday night’s qualifier. The fourth winner this Monday had already won his way to the final table by winning last week. 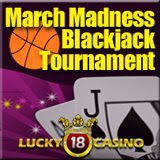 Lucky18’s “Mano a Mano” blackjack tournament is bringing out the best head to head combat every Monday night in March. Each week, 64 players compete with each other in hard fought head to head battles that narrow the field down to the final four. Apparently one player wasn’t satisfied with his $500 win last Monday and his free bid to the $5,000 Championship on April 15th. ‘Boblipp’, one of last week’s winners, made it to the Championship again along with newcomers ‘Billoch’, ‘Mr_sm00th888’, and wily veteran ‘Jef’. ‘Boblipp’ wanted more and played aggressively through the entire tourney with a barrage of 500 chips. Coupled with the fortunate cards he was receiving he put the others on their heels and playing catch up. In the semi-finals he faced off against ‘Billoch’ where he showed a more conservative style. They mocked each others bets into the middle rounds but then ‘Billoch’ upped the ante with a few big bets. ‘Boblipp’ followed suit but continued to get the cards. ‘Billoch’ was forced to double in the final round with a 14, but pulled a Jack to bust. ‘Boblipp’ was off to the finals again. In the fifteenth and final round, ‘Smooth’ (3150 chips) and ‘Boblipp’ (2500 chips) both laid a max bet of 1000 chips. ‘Boblipp’ drew a 10 and doubles to a good-looking 19 against the dealer up card, 7. But, ‘Smooth’ pulled a slick Blackjack A/J taking him to a 4650 chip count and a sure win because ‘Bob’s’ double will only get him to 4500. ‘Smooth’ won $500 and a FREE BID to the $5,000 Championship on April 15th. By far the most popular format in the Blackjack Tournament network, players find the “Mano a Mano” or head-to-head competition very fast paced and exciting. The final four players in each Monday night tournament this month win free entry to the final “Mano a Mano” Championship on Wednesday, April 15th. Weekly winners will receive $500 with $250 going to the second place player, $150 to the third and $100 to the fourth place player. Twenty-eight players will win free seats at the April 15th “Big Dance” Championship. (Buy-in that night is $55.) The first place player will win $2500. The second place prize will be $1500 with $500 for third and fourth place. Tournament details are available by clicking “Blackjack Tournaments” on the Lucky18Casino.com homepage. Although Blackjack is one of its most popular online casino games, Lucky18Casino.com also has 16 slot machines as well as craps and roulette. Lucky 18 slot machines offer some of the biggest progressive jackpots currently available to US players including Aztec’s Millions (over $1,000,000) and Jackpot Pinatas (nearly $1.2 milliion). Their massive $1800 Welcome Bonus offer is the most generous deposit bonus anywhere. Powered by Realtime Gaming, Lucky18Casino.com welcomes players from around the world, including the U.S.